Welcome to Part 4 of our 4-Part Series: A Rookie’s Guide to Buying a Muscle Car! Congratulations – you’ve made it all the way! As stated in our previous entries, this series is designed for the person new to the muscle car world. You know you’d like to own one, but until now you’ve had no idea where to start. This series will correct that minor issue! We’ll assume that you want to really like the car as well – even if you are purchasing it as an investment. Since we’ve already deal with Topic #1, #2, and # 3 we can now move on to the next and final step. 1970 Chevelle – needs a good home. Housebroken. Eats tires, though. The big day is finally here! You’ve now narrowed down the make/model that you want, you know how you’re planning to use the car, you have a fantastic idea of what it’s worth (and you’ve got the money to pay for it)….so now you just need to pick a few lucky candidates, evaluate them, set up your insurance, and make the transaction. Then it’s time to drop the hammer, Cole Trickle style. After you have selected a few lucky automotive candidates that fit your criteria, it’s time to go see if the cars are really as advertised. Now is the time to be picky. If the car is advertised as a “numbers matching” car, it really needs to be verified as such and it’s not out of line to ask the seller to give you proof. In fact, you can ask the seller for all of the pertinent info ahead of time and verify it using a few handy resources like the Vehicle Information & Decoding page from Year One. Better yet, ask for the ORIGINAL documentation that came with the car (like a build sheet). If the car is advertised as “good driver” or “recently restored”, ask for further details on specifically what is meant by this. Many times the phrase “good driver” means that the car runs and drives well, but may have a few (or a lot) of other issues that you’ll need to deal with ranging from simple wiring issues to major body work. The “recently restored” phrase can honestly mean anything from a new paint job to a coucours body-off-frame rotisserie restoration, so get details here. When going to see the car in person, go prepared with all of the information we’ve discussed in the previous articles. If you feel a little sheepish about going it alone, take a car buddy with you. You could also hire a broker to evaluate the car and purchase it on your behalf as well (they typically charge a flat fee or a small percentage of the sale price of the car). You may be suspicious that the pictures of the car are hiding some things, such as bad former body work. Now is the time to see if that’s true. A handy pocket sized magnet is a great way to check for excess amounts of body-filler that may have been used to patch big holes. Take the car out for a test drive as well. Test the brakes. Try all of the gears. Open and close all of the doors. Do they shut solidly or spring back open? Check everything and factor it in in your offer price. Remember, the car does not need to be perfect if it’s simply a fun weekend-mobile! If you purchase the car site unseen (which is happening more and more in the internet age) be sure to get as many photos up front as possible as well as a clear understanding of how issues would be handled if problems are found on the car after delivery. Investment cars are being purchased site unseen quite frequently now, and it’s quite safe to do so – especially from a high end reputable dealer. Doug Klein from American Dream Machines in Des Moines stated that they may sell 70-80% of their cars this way. Regardless of whether you examine the car first hand or simply order it and have it delivered, factor in it’s condition, documentation, and the like when negotiating the price. It’s really that simple! Arrrrgh! One more little hitch in your giddyup before bringing the car home! Insurance! Luckily, since you already know how you are planning to use the car, getting the proper type of insurance for your car will be a breeze. 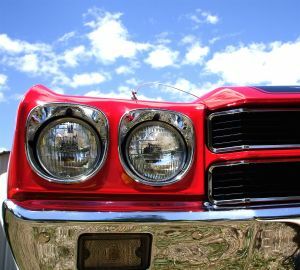 We have an entire post available on the topic called How to Insure a Muscle Car. Read that, and get your insurance set up. That’s about it! This is the last step in the process….and you quite possible already have completed this step following the evaluation phase. That’s fine. If you haven’t done so yet, now is when you actually pay for the car and take it home (or have it delivered)! As mentioned in previous posts, most dealers do have access to financing as a courtesy, but nothing works better then good old fashioned cash when making an automotive deal. If buying the car in person, take the cash with you, sign the title and bill of sale, give the seller the money, and wheel your ride home. If purchasing site unseen you’ll likely handle the title and bill of sale via snail mail and wire them them money (or send a certified check). In either case, you’ll need to get the car registered ASAP and you’ll need to provide the title, proof of insurance, and (typically) a bill of sale to do so. That’s it – our Rookie’s Guide to Buying a Muscle Car Series is now complete. Go burn some rubber!